I’m not going to make the deadline for Friday Night Fights, but I do have time to run down this week’s comics. First up is The Flash #236, writer Mark Waid’s last issue on the title and also the conclusion of his introductory storyline, “The Wild Wests.” From a writing standpoint, my biggest problem with this issue was the fact that it hinges on a story element which, honestly, I don’t think I’d noticed until it was pointed out. While that might have been lazy reading on my part, it made the rest of the arc feel a little unfocused, as far as the alien-fighting went. Still, part of the point of the story was to establish the new West Family status quo, and this I think it did pretty well. Freddie Williams II continues to draw a bulkier Flash than I’m used to, but his storytelling is alright and I could probably get used to him. I’m eager to see what new writer Tom Peyer brings. 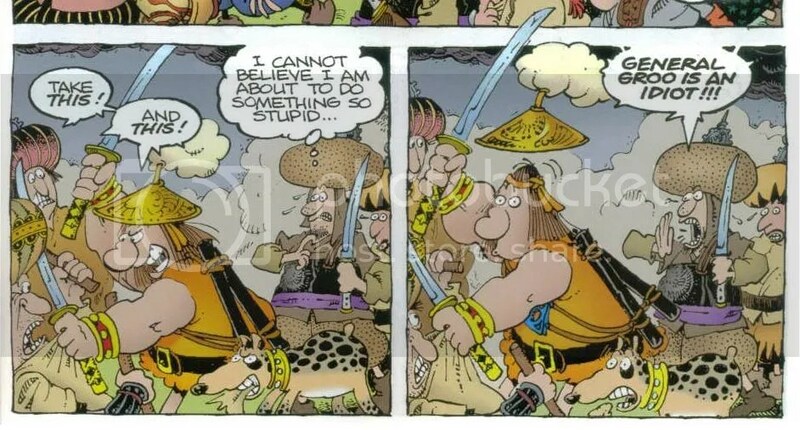 In Groo: Hell On Earth #3 (written by Mark Evanier, drawn by Sergio Aragones), the allegory gets pretty thick, although again I just this issue noticed that the pro-war leader has a “B” initial and the pro-environment one is a “G.” Also, the Bard’s rhyming narration was somewhat tortured at times. Otherwise, I liked it pretty well. Checkmate #22 (written by Greg Rucka and Eric Trautmann, drawn by Chris Samnee) was a good conclusion to the Mlle. Marie spotlight. However, either I’m misremembering things all over the place or last issue ended with Josephine being betrayed by her guides. Maybe I saw a Newsarama preview. Anyway, it was a good issue. Jo is competent enough, naturally, working her way across the Mideast and through various thugs, while flashbacks fill in her story and the story of Marie generally. I thought the “succession” scene was very effective — you’d think it’d be seen more frequently, considering DC’s army of legacy characters; but go figure. I like Samnee’s work pretty well, too — he’s a good storyteller and choreographer. Checkmate is the spiritual heir to Rucka’s, Ed Brubaker’s, and Michael Lark’s work on Gotham Central, and that’s about the best compliment I can pay it. I’m not sure how to approach the two stories in Justice League of America #17. I was glad that the main story (written by Alan Burnett, pencilled by Ed Benes, inked by Sandra Hope) picks up on the Brom Stikk subplot from last issue, and spins it into a larger Salvation Run-influenced plot. That at least gave last issue and this issue some collective meaning. Moreover, a big group of villains interacting with the Justice League is a natural plot for this book, and the twist applied to it was appropriate and intriguing. The second story (written by Dwayne McDuffie, pencilled by Jon Boy Meyers, inked by Serge LaPointe) focuses on the nature of Vixen’s mimicry powers, and specifically how she’s able to mimic specific abilities. I’m guessing it has a lot to do with Amazo, so let’s hope that’s either confirmed or discounted quickly. Overall, I’m frustrated with JLA for its current crossover-maintenance role — a Tangent story last issue, the Salvation story here — and while the latter plot shows some movement towards a more traditional League adventure, that movement has been incremental the past few months. Speaking of crossovers, here’s Booster Gold #6 (written by Geoff Johns & Jeff Katz, pencilled by Dan Jurgens, inked by Norm Rapmund), the big “Let’s Save Ted Kord” issue. It’s the kind of thing you read and enjoy on a superficial level, knowing full well that whatever changes, it won’t stick and Booster will end up learning a Valuable Lesson. I hope I’m wrong, and that all involved are just using that expectation to build suspense and actually have a happy ending. I’d like that for Booster. As for the issue itself, it’s good as usual. Rip Hunter gets a fun dramatic entrance. Jurgens’ figures can be a bit stiff, but he puts a fair amount of expression and emotion into Booster’s memories of Ted. Birds Of Prey #114 (written by Sean McKeever, pencilled by Nicola Scott, inked by Doug Hazlewood) made more sense after I read on the Internets that Lady Blackhawk was once mind-controlled into being King Shark’s moll. Also, while I enjoy spending time with the Birds, and continue to enjoy Scott & Hazlewood’s work, this issue felt very transitory to me. Oracle is riding everyone hard after the events of last issue. Misfit is the main outlet of her aggression. Lady Blackhawk and Huntress turn to booze. (They’re the relatively calm center of a brawl-prone bar, in a scene that maybe would have worked better had the fights in the background not been so obscured by the dark coloring.) These scenes are all fine on their own, and the last-page reveal is effective, but although groundwork is laid for future storylines, I didn’t get the sense it was all building to something significant. Maybe I just needed an obvious “Part 1” in the story title, I dunno. Finally, speaking of building to something, Countdown #15 (written by Paul Dini & Tony Bedard, story consultant Keith Giffen, pencilled by Pete Woods & Tom Derenick, inked by Wayne Faucher) went a long way towards pulling this often-haphazard series together. Concentrating on Ray Palmer and Earth-51 has focused the story’s energies better than a lot of other plot devices, I think, and it may be deceptively easy to say in hindsight that this plot should’ve been explored in more depth earlier on. In keeping with the “preliminary” nature of this series, I get the feeling that Monarch & co. won’t be defeated anytime soon, but instead everyone’s gaining useful experience for Final Crisis. I liked the movement on the Paradise Island plot, and also the return of Brother Eye. I guess the Pied Piper story will have to wait another week, though (at least). The art was pretty good — Faucher managed to blend Woods’ and Derenick’s disparate styles together. It wasn’t seamless, but it wasn’t a jarring transition either. Not bad, although I’m not ready to re-evaluate the entire experiment based on a few decent issues.